The amazing life of Pieter Krueler (1885-1986) provides a window into a full century of conflict such as one man rarely experiences. Four-War Boer traces Krueler’s highly colorful life from the Second Boer War, where he first served as a 14-year-old scout, through his service in World War I with the German army in East Africa, to the Spanish Civil War to World War II, this time with the Allies, and on into the latter part of the 20th century, when he served as a mercenary during the 1960s Congo Crisis. Later, by this time in his eighties, he became a civilian trainer for the original Selous Scouts of Rhodesia, and later still a trainer for South African commandos. This biography of a most remarkable man and warrior is based on six years of historical research through hard-to-find secondary and published primary sources as well as extensive interviews with Krueler himself. Interviews with German officers and others who knew and worked with Krueler amply document the biography, adding first-person testimony and giving the work the immediacy of a memoir. Following the Boer defeat by the British, Krueler sided with the Germans during the East African Campaign. He also operated in the Belgian Congo where he led native African soldiers on extremely dangerous missions. After WWI, Krueler’s distrust of both the rising Fascist and Communist movements in Europe led him to volunteer as a mercenary during the Spanish Civil War, where he worked with the Pyrenees Basque movement. In World War II, he worked as a reserve officer instructor, and later as a coast watcher to guard the coast of South Africa from German incursion. Krueler later served as a mercenary with Michael Hoare during the 1960s Congo Crisis, before serving South Africa to train commandos. A chapter of this book is devoted to the formation of Rhodesia’s highly elite Selous Scouts, along with highlights of several previously classified missions. This material includes a wealth of fascinating new information, and breaks the great secrecy surrounding Rhodesian and South African special operations, as unveiled through the experience of a man who was a founding father of counterinsurgency in Africa. Anne-Marie Lewis received a BA in International Relations (Peacekeeping and Conflict Resolution) as well as a MA in International Relations focusing on Transnational Security Issues and Counterterrorism from American Military University. With a blended background in public relations, international relations, international law and photography, Anne has coordinated and created projects in all forms of media. Colin D. Heaton is a veteran of the US Army and Marine Corps. A former professor at American Military University, he has authored six published books of military history, over thirty articles for periodicals such as Military History, Aviation History, and World War II. Heaton served in the U.S. Army and later in the Marine Corps as a scout sniper. He is the author of several titles and has taught history at American Military University. He currently lives in Southport, North Carolina. "Powerful recounting of world events from an African perspective." - Capt. Dale Dye USMC (Ret) Warriors, Inc.
"He was bred for warfare." "A must read for all military leaders." "His...lessons learned should be woven into the curriculum at every level of command." "A must read for anyone leading men in combat." "This is one of those books that capture you in the very first pages. I could not put it down." 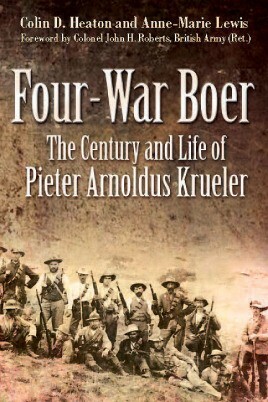 Peter Krueler, the "Four War Boer" served a life in hell and had the stories to prove it. Now, the "Grandfather of Special Forces," speaks again in this fascinating adventure tome, one best read beneath the stars, by a campfire's flickering flame. - Adam Makos, author of the New York Times bestseller, "A Higher Call"
"Four War Boer" is the fascinating story of Pieter Krueler; a warrior in the truest sense of the word. From his service in the Boer War, to fighting with von Lettow in East Africa to fighting as a mercenary with "Mad" Mike Hoare in the Congo before training Rhodesia's famed Selous Scouts; "Four-War Boer" is essential reading for every serious military historian. "Grueling combat like none I ever experienced is depicted. The hardships and horrors of the conflicts Krueler endured explode upon the pages of history and stun the imagination, and it all started when he was fourteen years old." "This book is a benchmark text on how to wage warfare in all its forms." "As a leader of brave men who fought in desperate battles, I can relate to much of this story. Incredible displays of heroism, leadership and high adventure worthy of military study. Recommended as a learning tool." - Waffen SS Brigadefuhrer Otto Kumm, Knight's Cross, Oak Leaves, Swords. "This book reads like a movie script, a combination of Indiana Jones and the Green Berets." "More than a biography, Four War Boer is a sweeping epic that chronicle the genesis of modern guerrilla warfare." "powerful book sheds eye-opening light on one warrior's first hand view points on pivotal events during a transformative and controversial century of military history"